need to be full length arms or sleeves. Should be around 2-3 mm thickness. 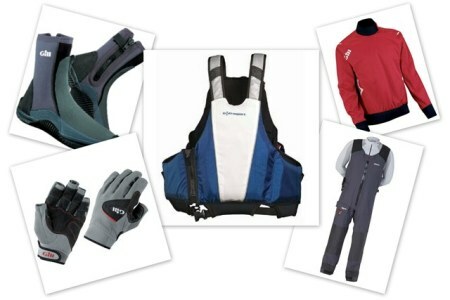 This is recommended gear, but if you show up to practice on a cold nasty day wearing jeans and a sweatshirt, no sailing for you. We need gloves when sailing because it is hard to grip a line when your hands are cold and wet. Gloves help with this. From what I have found girls and boys are different, girls hands and feet get colder easier. So girls may enjoy warmer gloves. A cheap but very sufficient option for gloves are the Gill Grip Gloves for $6. I use these often and they work great. I also enjoy my gloves with the finger tips cut off, this helps with ring dings. For booties we recommend a neoprene boot that goes up past the ankle or the Aigle waterproof boots. The neoprene boots you can get for pretty cheap. The neoprene is nice on cold nasty days because there is a good chance your feet will get wet and once the water gets in the boot, it becomes nice and warm. The Aigle boots are expensive, but they are nice because they are waterproof, unless you go in the water. With the Aigles you can where extra socks to keep your feet warm. Really all you need here is something waterproof to go over all your warm base layers. Any waterproof jacket will work. The "sailing" spray tops are designed with sailing in mind, so they don't have unnecessary pockets or hoods. I personally like something that is breathable when the air is hot but the water is cold. A good set of spray pants is worth the money. If you are just getting into sailing you don't need to go buy the best gear, and for spray pants anything waterproof will work just fine, even ski pants work great. But as you get older and stop growing it is worth the money to purchase a nice pair of Gore-tex salopettes (bibs). Stay away from waterproof pants with a spray on waterproofing coating. This coating will rub off in one season of sailing and then they are no longer waterproof. The salopettes are nice to keep your whole body warm since they go up all the way to your chest. Fleece is warm and comfortable and works great as a base layer. Long underwear and work out clothing works great also. You WILL go swimming in this outfit at some point, so always wear base layers that will dry quickly and keep you warm when they are wet. Obviously cotton sweatpants and sweatshirts are bad ideas. Jeans are also bad. Finally, get a good hat. Much of your bodys heat leaves through your head. So find a warm hat and wear it.